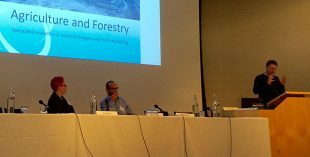 The panel discussion took place as part of the Defra and Royal Society two-day conference ‘Excellence in the Application of Evidence’. The aim of the conference was to bring the scientific community and policy-makers together to identify evidence gaps and potential areas for collaboration. The data and emerging technologies panel, chaired by Sir Martin Sweeting with panel members Dr Sue Black (of Saving Bletchley Park and #Techmums fame), David Askew (of Natural England and Earth Observation Centre of Excellence) and UCL’s Professor Mark Maslin, showed the benefits of what’s possible when different communities work together collaboratively. UCL's Professor Mark Maslin talks about analysing satellite images for forestry and agriculture purposes. The revolution in Earth Observation technologies has rapidly increased our capability to image environmental trends and changes at a local and global scale. Reflecting on their own experiences from developing microsatellites, Defra’s Earth Observation Centre of Excellence, Rezatec and running Hackathons, the panel members emphasised that while emerging technology can be applied to existing questions and evidence gaps, it can also be used innovatively to address emerging gaps. Emerging technologies, such as the development of DNA technologies, has enabled a greater understanding of processes with novel molecular tools. The rapid expansion and development of the molecular toolbox is promising for a broad range of applications. During the conference Andy Nisbet, Natural England, presented the potential of molecular tools for environmental and conservation monitoring and surveying. For example Natural England has successfully developed a method for using environmental DNA (eDNA) to detect great crested newt populations in ponds and are investigating the potential uses of eDNA in other environments. Emerging molecular techniques have also been applied to research in tree health. Richard Buggs presented a project in collaboration between Royal Botanic Gardens Kew and Queen Mary University of London, which sequenced the genome of a British ash tree (Fraxinus excelsior) and 37 ash trees from across Europe. With this knowledge the project will examine the genetic basis of resistance to ash dieback and the emerald ash borer. Sandra Denman, Forestry Commission, and James McDonald, University of Bangor, also presented how using sequencing technology combined with cultivation-based techniques has enabled the identification of polybacterial causal agents of Acute Oak Decline lesions, and provided insight into polymicrobial interactions and decline-diseases. A clear message from the conference was that the use of data and adoption of emerging technologies can lead to innovative ideas, practices and operational applications. Sue Black encouraged attendees to consider skills in data and technology as a gateway, enabling our own creations. As founder of #techmums, an organisation which teaches mums digital skills, Sue shared her observations and experiences where digital skills and technology have instilled participants with confidence, opened pathways and provided a foundation for innovation. Working with schools running hackathon events, Sue also discussed how teaching children digital skills can enable them to harness technology and create for themselves. The panel discussion and projects working with data and emerging technologies clearly showed how data and technology are being applied innovatively to answer challenging questions with exciting developments. It is therefore with great promise that we look to the future of data and emerging technologies, through collaboration and innovation building towards today’s answers and emerging evidence gaps in the future.